In The Movies - Big Daddy's Restaurants......a Tribute to a Lost Legend! When idealistic minor author Leslie Braverman dies suddenly from a heart attack at the age of 41, his four best friends decide to attend his funeral The quartet of Jewish intellectuals drawn from the four corners of Manhattan consists of public relations writer Morroe Rieff from the Upper East Side, poet Barnet Weinstein from the Lower East Side, book reviewer Holly Levine from the Lower West Side, and Yiddish writer (and chronic complainer) Felix Ottensteen from the Upper West Side. The opening credits make clear that these men have been friends since their youth. They agree to meet at Christopher Park on Sheridan Square, a Greenwich Village landmark, from which they travel in Levine's cramped Volkswagen Beetle. Due to confusion and bad directions from Braverman's widow, the men attend the wrong funeral but finally arrive at the cemetery in time for the burial. The centerpiece of the movie is the extensive running discussion among the four men along the way, as they talk about everything from philosophical observations regarding death to the relative merits of classic comic book characters, all while maintaining a strongly Jewish comedic tone emphasizing irony and sarcasm. Rieff, who emerges as the central character, periodically experiences absurdist fantasy episodes or daydreams involving his own mortality, eventually delivering a soliloquy to a vast array of gravestones bringing the dead up to date on what they have missed lately. The character Leslie Braverman never actually appears in the movie, by flashback or otherwise, and is known only through descriptions and references to him by other characters. (Braverman's coffin is shown briefly, with him presumably inside, at the cemetery.) 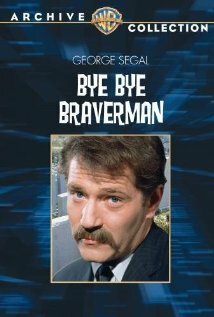 While Braverman is dead from the outset in both the book and the movie, there are occasions in the book but not the movie where his own words are quoted, often at considerable length as from a letter. The Warner Brothers/Seven Arts release was filmed on location in Manhattan, the Bay Ridge section of Brooklyn, and Cedar Grove Cemetery in Flushing. The movie is notable for its gritty but romanticized and picturesque portrayal of New York City as it was in the 1960s, showing elevated train tracks and bodegas and using numerous aerial shots. In the meeting scene at Sheridan Square, the office of The Village Voice newspaper, a landmark there for decades until a later move, is visible. A scene where the mourners stop to use a pay telephone takes place in front of one of the legendary Big Daddy's Restaurants then located on Coney Island Avenue in Brooklyn. The scene of a traffic accident between the Volkswagen Beetle and a Checker cab takes place at the intersection ofEastern Parkway and Bedford Avenue in Brooklyn, and the Town Hill Restaurant nightclub on the corner, notable at the time for its live entertainment, can be seen prominently in the background.